Mr. Friedman, I wanted to share with you a nice story that I was hoping you could share with other shipmates. My dad, AMS1 Herbert Alanson Frye was killed aboard the USS Forrestal on July 29, 1967. Dad was from Saltville, VA and this past Memorial Day weekend the town of Saltville and the state of Virginia dedicated a newly constructed bridge connecting Saltville to Broadford, VA in dad’s memory. 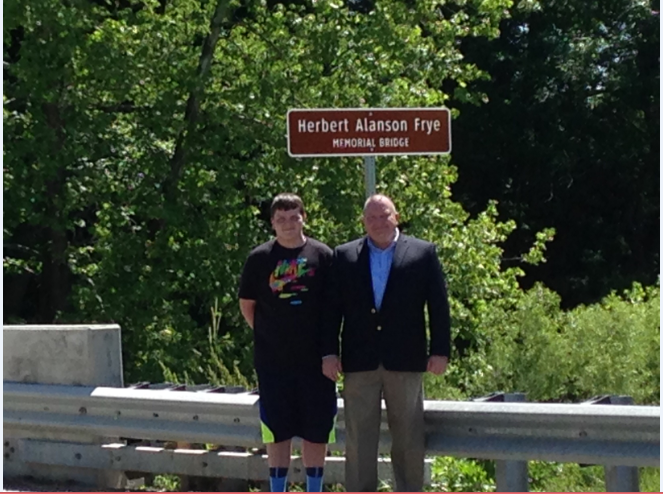 I have attached a photo of my son (dad’s grandson) and I standing under the sign.